The last time that I was at my dad's house he let me go through some things that had been tucked away for some time now. Pictures, old letters, newspaper clippings, things that I had made when I was little. All this time I hadn't even known that he had kept these little bits and pieces of our life and I was thrilled to sit down next to him on the floor and go through everything and remember and recall and for some things ask questions and hear stories. My parents have since divorced and I've since come to peace with that. This is a photo of my mom that was in our local newspaper when my parents were young and first together. She was a weaver and my dad was (and still is) an artist (painter). Looking at this old photo I see such a beautiful and free spirit. Someone who had so many ideas and hopes for a full future. Someone intent on being who she was. Someone a bit like me perhaps. Just made me think about how as a teenager and in my early twenties I was so intent on breaking any and all ties that I had to my mother, showing her that I was so different than she and now here at age 30 I see that we have more and more in common every day. I just had to wait a bit so that I could look back and be able to see her from a different perspective perhaps. 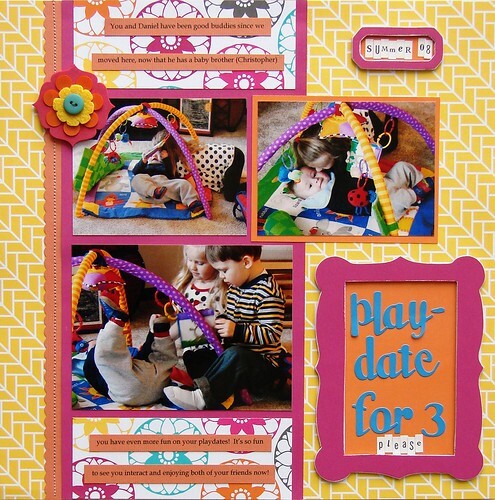 Be sure and check out the Creative Imaginations blog today and the next couple of days for peeks at what the team of designer's came up with using Jenn Mason's Parts & Parcels albums. 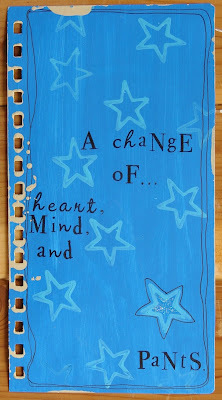 I created mine thinking that the little journals inside would be used for just that, journaling. Blessings and thoughts on day to day things mostly. 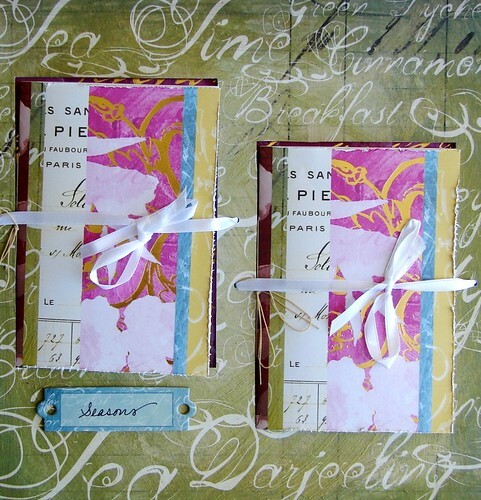 Really love how it turned out with the Tea Time Collection of patterned papers and embellishments by Christine Adolph. It was a wonderful weekend here. Sometimes I forget how good I feel after spending time outdoors and when I go back and remember it leaves me feeling full and strong and invigorated again for the path of tasks that lie ahead. I need to remind myself that this is what is important, that this is what fuels me. It was the perfect weekend for hiking and that is what we did. 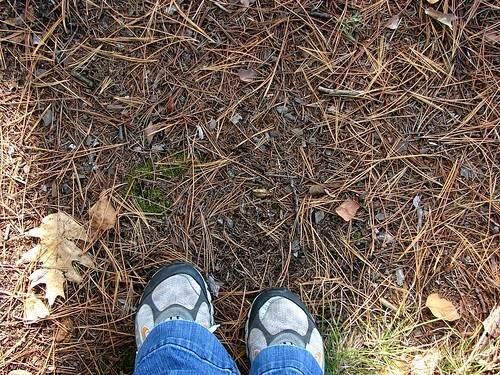 We explored some new (to us) trails and enjoyed the quiet that only comes from deep within the woods. The colors were beautiful too...I'm pretty sure that if this wasn't the peak weekend for Fall colors then next weekend will be for sure. It's amazing to me that there is so much beauty all around us and it makes me sad to think that so much of it goes un-noticed by so many. I finished my book and I am happy with how it ended. 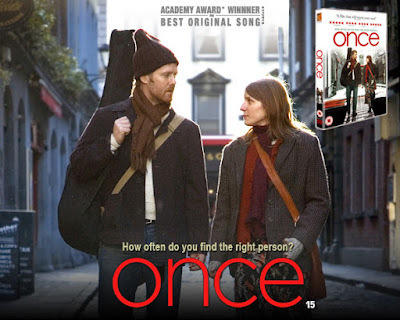 It was one of those reads that left me feeling satisfied and I think even helped me to grow a bit. I'm on now to read Twilight by Stephenie Meyer...I have to see what all the hype is about I guess. I also have The Audacity of Hope by Barack Obama on my night table. It feels good to be reading at a more regular pace again. Something that seemed somewhat impossible when Zoey was just a little peanut. I am hoping to participate in Ali's weekly creative project this week: documenting a week in your life with photos + words. Will share here what I come up with. It's been a bit of a strange week here. I feel hurried and rushed and just a bit off kilter. Memories are odd things...they can be so fierce at times and so loving at others, and they always tend to sneak up on you when you least expect it. I've always been one that has looked to "signs" and moved alongside of them and this week was just one of those where it seemed there were signs everywhere I looked that somehow had a hand to play in my life directly if I should so let them. Today Zoey came home from school in tears because another little girl wouldn't let her be the princess when they were playing at recess and I just about had a full, down and out breakdown. Girls can be so mean, I know this, but I didn't think all this stuff would start at the age of 4 I guess. We talked about how she could go and play with other friends and how she didn't need someone else to "let her" be the princess but it was a hard lesson to give and even a harder one to take I'm thinking. She wants that girl to let her be the princess after all. Arghhh. I was wondering why the last several times she went to school she wanted to wear a dress, have her hair in a bun or wear her fancy shoes. 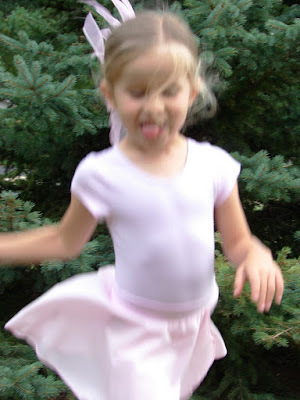 Now I get it that she was trying to be fit to be a princess (in the eyes of this other little person). I wish that I could shield her from all hurts (the big + the little). Being a parent is so hard sometimes...and as I read this over I totally know this is little and minor and we are so blessed to not be dealing with something so much more, but still...as her mother I am allowed to wallow and worry. Looking forward to the weekend...hoping to finish reading A Family Daughter by Maile Meloy (I'm almost there - found it to be a good and quick read). the constructed structure daddy built. on forested lakes alive with sounds. This was a super quick and easy project using some of the Creative Cafe felt pieces and their fun clipboards (which come in many different sizes and styles by the way!). This could be a fun little thing to house pens and pencils, notes, postage stamps or other miscellaneous goodies that we acquire around the house. Might also be cute for a special little girl to house special treasures in! I first adhered the Lime Rings Felt Border along the backside of my clipboard with Liquid Stitch adhesive (I used the same adhesive for my Lucky Apricot Alphabet letters on the font of my pocket). I machine stitched my pocket (measuring 4 1/4 x 5 1/4 inches) onto my rectangle of felt that I cut to measure 5 1/2 x 11 inches. I then machine stitched my Spirit Pink Flowers Border and attached along the outside borders of my rectangle piece of felt and along the top of my pocket with Liquid Stitch. Last, I added my bow to the top and I was done! Just a simple one this morning of a fun picture of Zoey in her Elmer Fudd hat! Also wanted to share that we are getting some of the new Pink Paislee lines that release at the end of October over at Scrapbook Circle. Tinsel Town and Sweet Cakes will be offered as two additional mini kits in November and will include 1 sheet of each of the patterned papers, the ribbons, rub-ons, the postcards and an alphabet. Scrapcakes will be selling the mini kits for only $15! Plus, if you spring for the regular monthly kit they will ship for free! Can't beat that right? 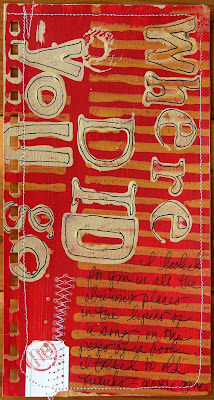 Pretty self-explanatory....used paint and stamps, some machine stitching. I stumbled upon some of the speeches read at some of the past TED, Talks conventions and these two in particular struck a chord and are totally worthwhile taking the time to listen to I think. 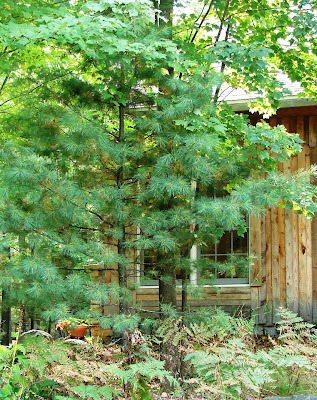 quite simply it's a small out-building that looks like a barn that has been made into a beautiful dance studio. It was just magical pulling into the drive and discovering such a scene. Surrounded by flowers and trees and with the twinkling lights inside, hearing just the leaves rustle and the birds singing...it was just magical. 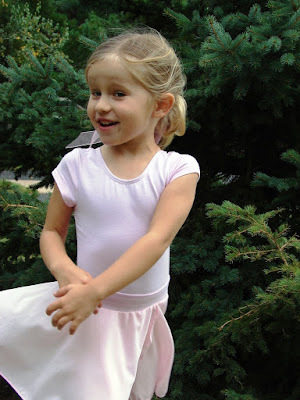 The first day that they had class it was cooler and there was a fire going in the fireplace that's located in the studio and the little girls all stretched and danced in front of the warm, crackling fire. The instructor, Ms. Dana is just the sweetest and is so good with the girls. 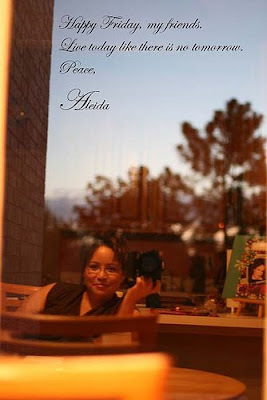 She is so soft-spoken and kind...there is just a sense of peace that you gather from her just by being around her. 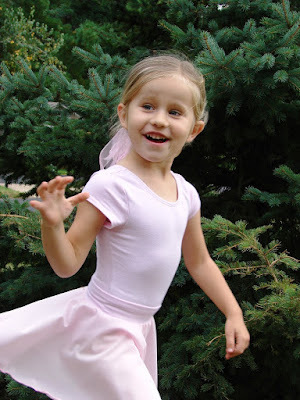 Yesterday she had the girls dance outdoors in the gardens while she shared with them a story about 7 little princesses (there are 7 little girls in this class). 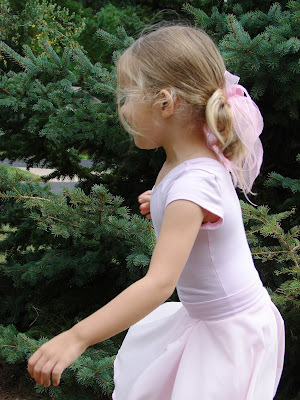 She led them along a wooden log, had them leap over a pink sash that served as a gate, took them amongst the toadstools, tip-toed through the flowers, sat quietly on the stone steps and then led them back to the studio. It almost made me cry and I know that I would have had the other mothers not been there with me! 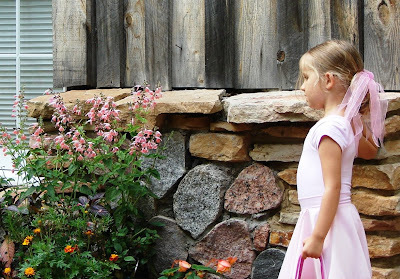 I am so glad that Zoey gets to experience something as sweet and pure and as real as this and that dancing through the garden gate will forever be a memory of her childhood. Last night I felt inspired to create something little (just didn't have the energy for anything else and I wanted to spend some time with Ethan) and the card above is what transpired. Very simple, but I think it's cute! 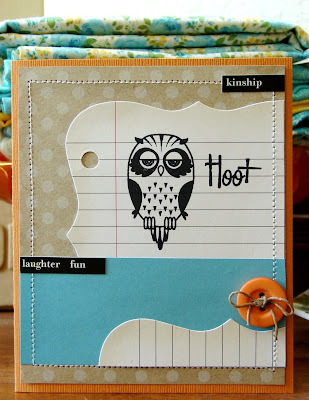 The owl stamp is by Technique Tuesday. 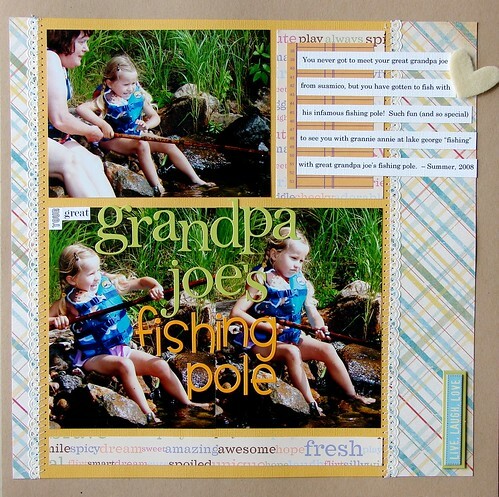 The dot kraft paper is Making Memories, journaling page was taken from a Jenni Bowlin mini-book, phrase stickers are by 7gypsies, button is Basic Grey and the twine is Creative Imaginations (part of the Parts & Parcels Collection). 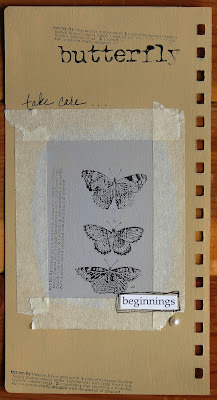 Some more journal pages to share...really simple ones. The first one I used a quote from the movie Mr. Magorium's Wonder Emporium (that movie is just full of fun little quirks and bits of brilliance in my opinion). I'm hoping to get back into my art journaling again, I've noticed that it's kind of fallen off to the wayside since Zoey started school. 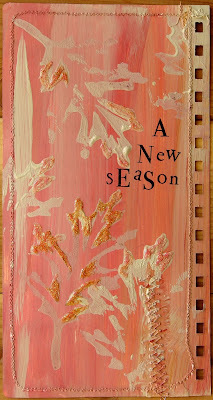 That's the beauty (and forgiveness) concerning art journaling though, it's always there when you decide to come back to it. I've been going through my paper scrap drawer and I threw out a lot of stuff (stuff that I can't even remember buying!) 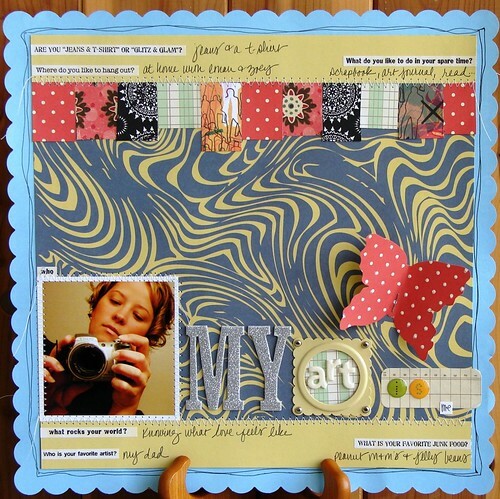 and I was inspired to use some of the little bits from the drawer on a layout and this is what I ended up with. 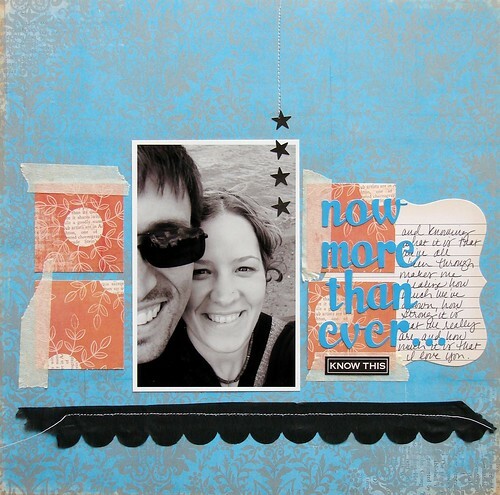 In scrappy news, I'm excited to share that I have had a layout requested for publishing in Scrapbook Trends Magazine! This will be my first time working with them and I am so excited to be a part of their beautiful publication. My layout (which is of Zoey) will be in the February, 2009 issue. This weekend is a busy one here...we have a Scrapbook Convention in a neighboring town and the store that I work for is representing Creative Imaginations at our booth which is a very cool thing and make me super proud. Speaking of which, have you had the chance to check out the new videos by Creative Imaginations? They now have CITV and are preparing and showing video tutorials, product demonstrations and soon will be sharing artist interviews as well! Super fun stuff, be sure to check it out! Picture taken this summer on the road while traveling to Superior, 2008. 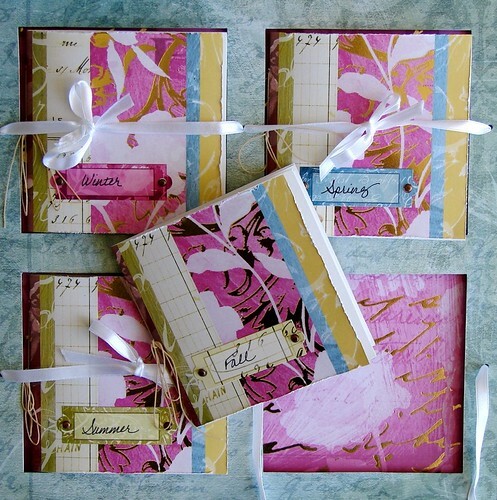 The fun thing (well, one of many things actually) about working at my local scrapbook store is that I get to create things for classes, kits or demos for the store a tad bit earlier than maybe you would otherwise. 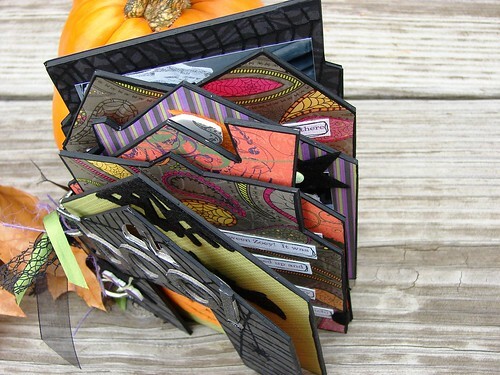 As you can see here, that meant that I got to create a fun Halloween kit that we will now cut papers for and use for a class kit. Truth be told, I am not usually one that goes overboard for Halloween but for whatever reason, this year I am loving it! 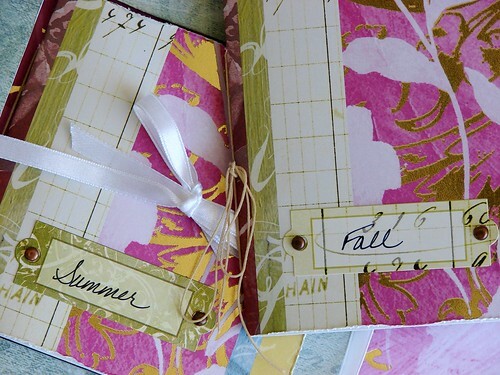 This album is actually a blank album by My Little Yellow Bycicle that I then altered with patterned papers by My Little Yellow Bycicyle, Heidi Grace Designs and Lil Davis (both by Fiskars). The embellishments are mostly by My Little Yellow Bycycle as well, but I used some of the Halloween punches by Fiskars (the ghost and the cat) just because I couldn't help myself! 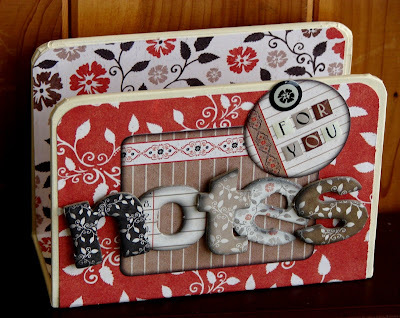 The trims are by May Arts and the chipboard letters are by Scrapworks. Since working on this I'm getting more and more excited for Halloween and am thinking up more fun ways that I could decorate here around the house. One idea that I loved was Candice Stringham's Halloween decorative banner that was in the most recent issue of Creating Keepsakes Magazine. The crows that she used for it are actually available as a template online here. Thought I'd share some more Creative Imaginations projects that I did for the product catalog. 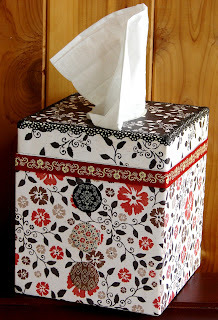 These use the Bare Elements letter holder and the tissue box which I altered using Samantha Walker's, Day by Day Collection of patterned papers and embellishments. Super fun and easy little projects that turned out pretty cute and would both actually be quite perfect as a little teacher gift as well! Something that I guess I'll have to be thinking about for the near future! Hope everyone had a fabulous weekend! It was a good one here as the Packers beat the Lions 48-25! We have one very happy husband and papa here in the house! Happier than even normal that is! =) Ah, yes...I find myself yet again in the midst of yet another football season and couldn't be happier! Just for fun I dug out some old photos of my dad and I from when I was little. Permed hair and all...I even remember the name of my Cabbage Patch doll, it was Chester. I was pretty lucky that I had my dad home with me most of the time growing up. He was/is an artist and always had his studio within our living quarters wherever we lived and it was so nice to have him about. Missing him lately and thinking about him. Especially now that Zoesie is in school and we're racing about in the morning's getting breakfast and everything ready to go for the day...it reminds me slightly of when my dad would struggle to get me up and out of bed for school by singing "Rise and Shine" at the top of his lungs at the bottom of the ladder (getting to my room from inside our house was like climbing into a funny little loft area) and how he would make me a good breakfast every morning, before sending me on my way. It's funny how you don't realize all the love behind that simple little act of preparing a good breakfast until many years later when you are doing the very same thing for your children. I think that one of the best things about having a child is that we are reminded of the pure joy of what it means to be child-like again. 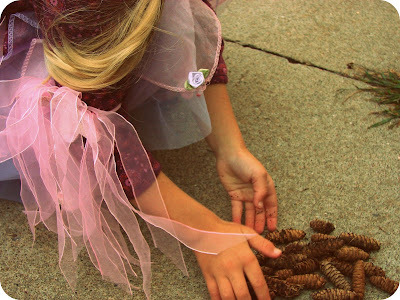 Through Zoey and her play I am reminded of the delight of things like making soup for the animals outdoors out of pine cones and leaves. 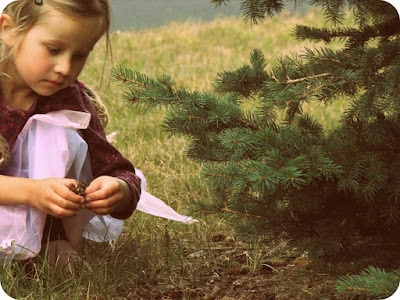 I am reminded of the smell of early Autumn...the smell that is of flushed cheeks and dirty fingernails, the one that consists of the sweat of determined play, organic in it's very make up. Do you recall screaming with delight at being chased between trees at dusk? Do you remember getting a wet bum and not caring in the slightest? The asking of one more minute of play before it was time for a bath? We've been collecting little bits here lately. Leaves, pine cones, acorns. We have chipmunks (an abundance actually) that live in our front yard and they have so kindly tunneled several places here and there and the other day Zoey had the idea that we should help them gather food for the winter...so we did. She placed the acorns at the top of each little hole (of their tunnels) and sent them on down, one by one. Being extremely diplomatic in her distribution of acorns as to be fair. I still remember the first time when I truly questioned if there was indeed a God. 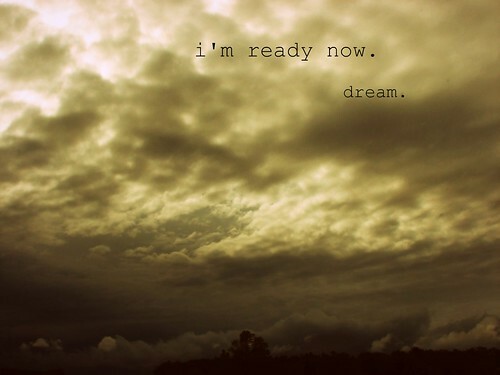 I don't know why I am thinking this here and now while I am sitting here thinking about Zoey and play, but I am. I was in third grade and I was with my friend Lynnae. We were across the street from my house lying in the lawn of our church and it was approaching dusk. It was early Fall. We had been playing and running and were tired and hot but chilled from the coolness of the changing temperatures. We were looking up at the clouds and were quiet and then one of us asked (I can't remember who) if the other thought there was really a God. If he/she really could exist. Did exist. I remember feeling brazen and a bit bold at having this conversation right outside of our church. I remember seriously contemplating it too. I wonder if we all question and come to terms with this idea at an early age or if some never do. Question, that is. I know that for me, I have come across this very process of thinking and line of questioning so very often in my life since that very first time with Lynnae. I want Zoey to ask and to wonder. I want her to know that in continuously questioning she will be guided to her own idea of what is reason or truth or discover that perhaps reason doesn't even fit into the equation at all. I want her to trust herself with her own answers and to know that in her life, at all the different points and junctures that there will be, those answers are most likely the right answers for her to have at those given times. I want her to know to not even have an answer is alright even. I hope that when or if the time comes that she does wonder aloud, that there will be no one there to tell her a definite answer...that they leave it for her to decide. 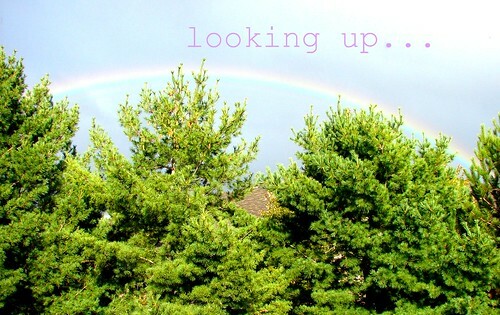 (Photo taken out of Zoey's window 9/08/08). 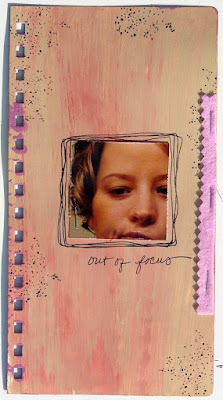 from Scrapbook Circle. 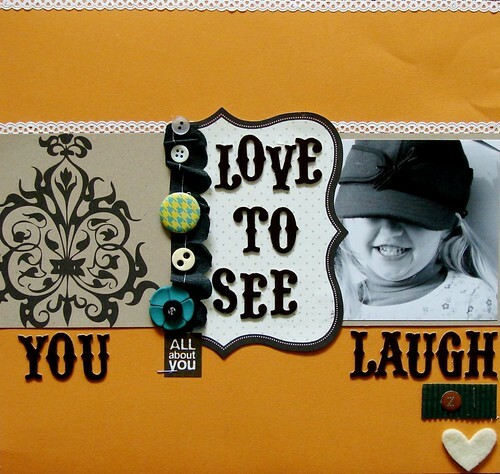 Love this kit and the mix of papers and embellishments...really having fun with it. It's actually the first time that I've gotten my hands on some of Jenni Bowlin's things and I must say that it will not be the last now! 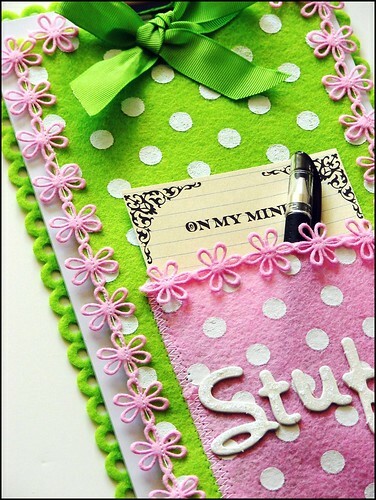 The crepe paper trim, stars, "Know This" sticker and journaling papers are all by her on the layout below. I'm especially loving the crepe paper trims. 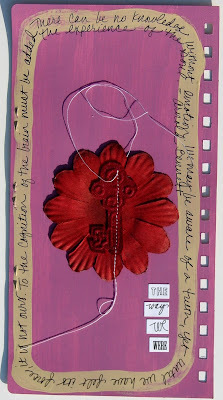 On the layout below I used mostly all American Crafts papers and embellishments (from the kit). 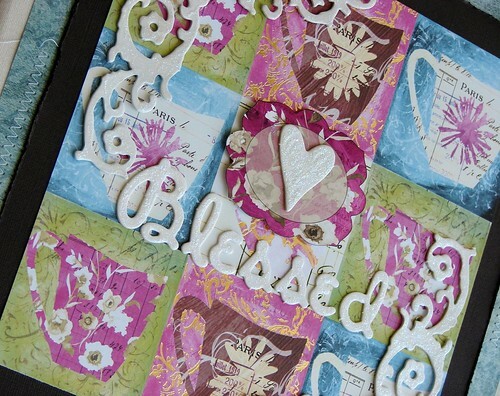 The chipboard frames are by Scenic Route and the blue alphabet stickers are by Pink Paislee. Today marked Zoey's second day for Pre-K and so far all is well! 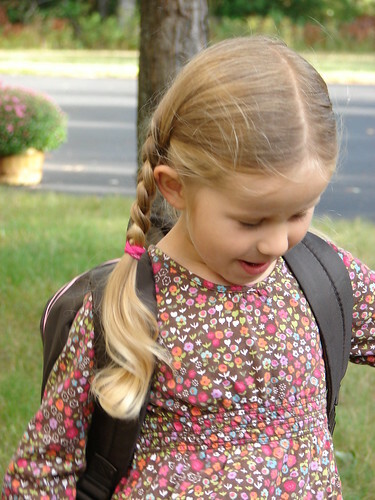 It's so funny how grown up she seems with her back-pack on. 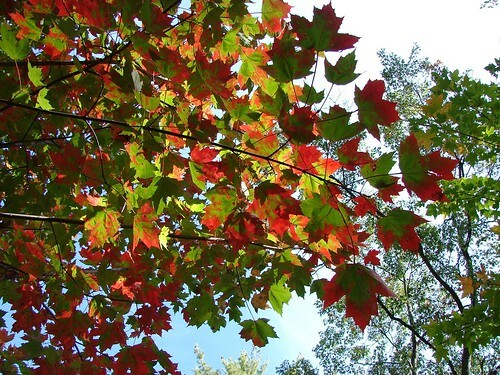 The weather here is getting cooler and the leaves are even starting to change on some of the trees. Love this time of year so much and look forward to enjoying caramel apples with Zoey, going for more family hikes, raking up some piles of leaves and all that other good stuff! Wishing everyone a wonderful weekend! 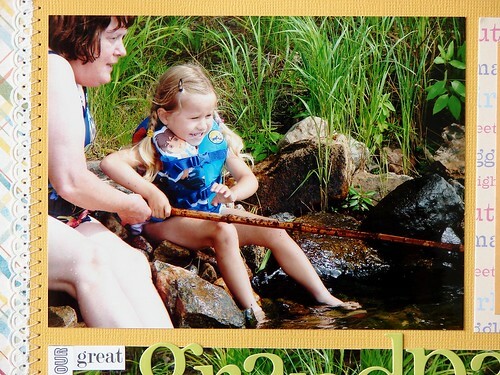 I have a ton of fun photos from this summer that were taken at Lake George with Ethan's family. 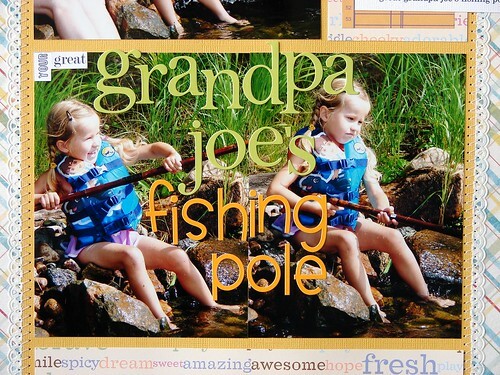 These were taken late summer and are of my Mother-in-Law and Zoey "fishing" with her Great Grandpa Joe's fishing pole. 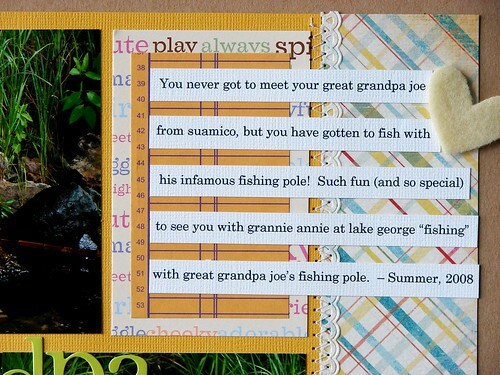 They are some pretty fun pictures and special too because Zoey never had the opportunity to meet her Great Grandfather. I've noticed that lately I've been printing my journaling on computer and cutting it into strips, usually I hand write my journaling but I'm having fun changing things up a bit. Zoey's first day of Preschool was fantastic. I wish that I would have brought my camera when I went to pick her up from her morning. 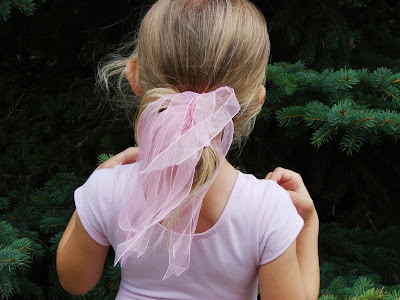 Her cheeks were flushed bright pink, her eyes were sparkling and her hair was flying all around from being blown this way and that on the playground while playing tag. I got there a little early because I knew that they would be outside playing and I wanted to just peek in on her and observe how she was interacting with everyone in the group. It was the neatest thing to see her playing with little girls that I haven't even gotten the opportunity to get to know yet. 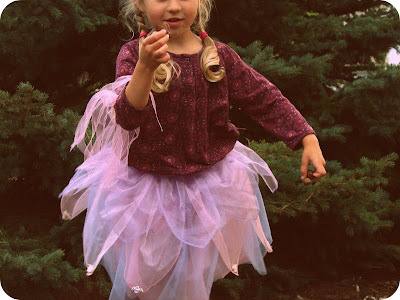 There she was holding hands with them and skipping and pushing someone on the merry-go-round and listening to her teacher and joining the other girls in the makeshift line to go back into the school. She only has 6 classmates at this school (one of the reasons we chose this school was because of the smaller class size) and all of them are girls! It is quite the site to see all these little girls running and skipping and giggling together. I have an inkling that Mrs. Zimmerman has a lot in store for her this year! When Zoey saw me, she came running out of the double school doors and jumped up into my arms...her first words were (expressed with the deepest of concern), "Can I come back to school mama?" I assured her that there were going to be many more school days to come and than I took her out for lunch so that she could then share all about her first day. It's funny too because just when I thought she had shared all that she could about her day something else would pop up and she would share some other little bit about someone or her teacher or what they did or a story they heard, etc, etc. It's so strange and amazing to think that she has a life now that is beyond our four walls. I am so proud of her and so excited for the opportunities that she is going to have in this life. I continue to surprise myself as well at how excited I continue to be about all these little life milestones that she comes up upon. I was never that eager girl who was dying to have babies one day and here I am loving every minute of being Zoey's mama. Zoey's first day of being snack leader at school is this Monday and so now I'm trying to figure out something fun that we can put together for that. I'm sure the novelty of all these things will wear off...but for now I am enjoying every minute of it! 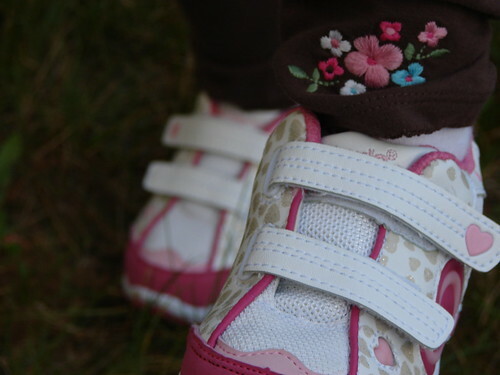 but it also means that she gets to wear her new heart, light-up school shoes! These were picked out solely by her just for this occasion. She's been counting down the days until she could wear them to school. The drop-off went well (I think I was more of a bundle of nerves than she was actually), and she barely noticed when I left the classroom. That's a good thing right? Now I'm just watching the clock until I go pick her up again! It almost seems surreal that she is going to school already...excited for what the year brings for all of us.